For a lot of things, the 1980s have become a punchline. Mullets, slouch socks and My Two Dads all seemed like good ideas at the time. But some things from the 1980s will never grow old, like The Goonies, Pac-Man and the music video for A-Ha's "Take on Me." 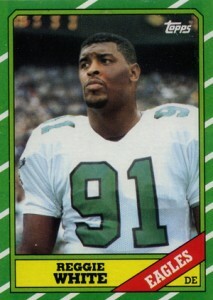 In the same vein comes the list of the top 10 football rookie cards of the 1980s. Spanning all parts of the decade, the list encapsulates a good part of a generation's greatness. Although many sets, particularly in the latter part of the 1980s, suffer from massive print runs, they're still not nearly as bad as what you find in baseball. At least that's the case for sets released before 1988. Every card in our top 10 list of the 80s best football rookies pictures a Hall of Famer, just as one might expect. With all the players' careers over, prices should remain largely stable. There will likely be some movement in one direction or the other, but likely not much unless it's part of a bigger hobby trend. Rankings are based on average online sales of copies graded 9 Mint by PSA and Beckett. A career New York Giant, the quarterback may not have the fanciest rookie card of all-time but we are talking about a two-time Super Bowl winner. Combine that with the age of the card and you've got a card that will always have demand. By the time 1989 rolled around, print runs were soaring. 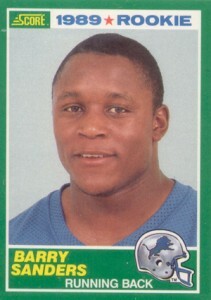 As a result, prices of the 1989 Score Barry Sanders, the running back's most popular rookie, have softened in recent years. This could make it a bargain in the years to come as there's lots of room for growth once again. It looks as though Lawrence Taylor's troubling legal issues may have caught up with him as far as the hobby goes. Although he is still one of the most widely recognized (and collected) defensive players in NFL history, his appeal has softened in the past few years. 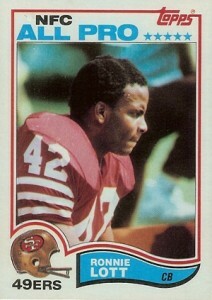 As a key part of the San Francisco 49ers dynasty of the 1980s, Ronnie Lott will always have a following in the hobby. His Hall of Fame career kicked off in a big way as Lott got seven interceptions in his rookie campaign. He also didn't have to wait long to get his first Super Bowl ring with the 49ers taking Super Bowl XVI. Who said defensive players weren't collected. The third defender (and -- small spoiler alert -- last) on the list is the late Reggie White. The "Minister of Defense" was a 13-time Pro Bowl selection. In 2010, White was named by the league as the NFL's seventh best player of all-time. 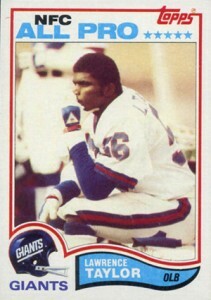 As far as top football rookie cards of the 1980s go, he's right up there as well. As far as all-round great sets go, 1984 Topps Football is one of them. It features rookie cards of two of the greatest and most popular quarterbacks of all-time. First up is Dan Marino. His career stats are legendary. His appearance in Ace Ventura: Pet Detective was amazing. Okay, maybe not but it was still worthy of a couple of cheap laughs. Yet, the fact that Marino never won a Super Bowl is something many still hold against him. 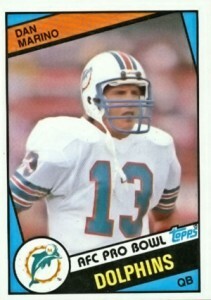 Obviously not a ton of collectors, as the 1984 Topps Dan Marino rookie still commands a lot of attention. 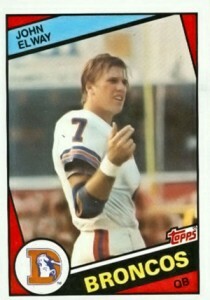 For the majority of his career, John Elway was in the same boat as Marino. He couldn't bring a Super Bowl to Denver. That changed in Super Bowl XXXII when the quarterback led the Bronco's to their first-ever championship. With that off his back, Elway followed it up with another Super Bowl the following year, cementing his place as one of the all-time greats. It also took his 1984 Topps rookie card to a new level. It's weird seeing Steve Young in a Bucs uniform. For many collectors, it can't be too strange as it's one of the top-selling football cards of the 1980s. 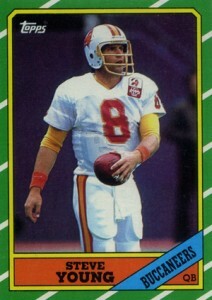 And the 1986 Topps Football Steve Young rookie card isn't even his first Topps card (we'll get to that in a bit). It took the quarterback a while to emerge as a hobby favorite, spending several years as Joe Montana's backup. Yet, once the proverbial torch was passed, Young emerged as one of football's best quarterbacks. He retired with three Super Bowls, two MVP selections and seven trips to the Pro Bowl. Is Jerry Rice the best football player in NFL history? The league thinks so. 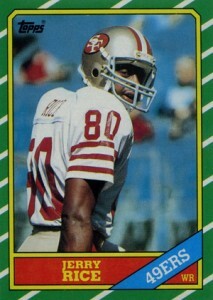 The wide receiver spent most of his career as the main target for Joe Montana and Steve Young in San Francisco. Among his many records is the one for most career touchdowns with 208. Rice has three Super Bowl rings and was the game's MVP at Super Bowl XXIII. 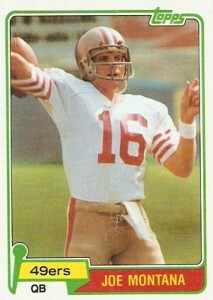 One of the most beloved and respected athletes of all-time for any sport, Joe Montana has long been a hobby favorite. The face of the 49ers dynasty it seemed like Montana's warm smile was everywhere. It should come as no surprise that his 1981 Topps card remains the best and most valuable football rookie card of the 1980s after all these years. ERIC DICKERSON 1984 TOPPS ROOKIE CARD GRADED 8.5 NM-MT+ RAMS!! and 88 Topps Bo Jackson RC. Jeremy Brannon (ID 54209) � Thanks Jeremy, My notes had TONS more great cards. I actually went out and bought the Aikman immediately after writing the piece. Along with Thurman Thomas. 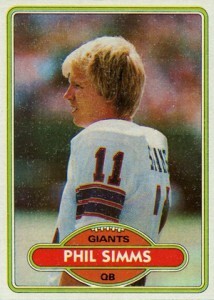 Phil Simms is not in the HOF. 2014 Topps Chrome 1 1 Allen Robinson 1985 Rookie Refractor 99 99! PSA 9 Mint RC!